Frank Camp as Uncle Barnaby. The family-perfect show is performed at the Woodstock Playhouse December 5 to 7 as the Mother Goose characters begin their journey in Mother Goose Land, travel through the spider forest, and end with a victory in Toyland, where all the elves and the Master Toymaker are working to meet the holiday deadline. Kids receive an after-show meet-and-greet with Santa. Tickets $32-$40. 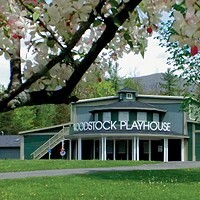 Woodstockplayhouse.org.